7 Ways to Stop Sugar from Destroying Your Skin! You’ve heard that too much sugar is bad for you. You may have even tried to cut back. How is that going? Do you find yourself caving into cravings more than you’d like? Here’s more motivation for you: too much sugar-or simple carbs that break down too quickly in your bloodstream-can damage your skin, and accelerate the aging process. Some say that your sugar habit shows up on your face-in wrinkles. Preliminary studies indicate that the wrong kind of diet can result in wrinkles and other signs of aging on our skin. The theory goes that when we have too much glucose in the bloodstream, some of it may attach to proteins, forming “advanced glycation end” products (AGEs) that can damage the skin over time. Scientists have found that diabetics, who struggle with high blood sugar levels, are more likely to have higher levels of AGEs, and as a result, tend to age faster than those with lower levels. AGEs are thought to degrade collagen and elastin, those compounds in skin that keep it firm and taut, which can result in sagging and bagging, as well as wrinkles. In 2001, for instance, researchers reported that glycation generally shows up around 35 years of age, and then increases from there. They also noted that exposure to UV rays enhances the process of degradation, damaging the elastic fiber network in the skin’s tissues. In a 2012 study, researchers looked specifically at AGEs and skin aging, and found that these damaging products could attack collagen, leading to stiffness and decreased flexibility. They also encouraged inflammation, and led to increased free radicals after exposure to UV rays. In 2013, the connection between glycation and skin aging became even clearer. Researchers tested blood sugar levels in about 600 participants, and then showed pictures of those participants to another group of people. Can you guess what they found? Those with higher blood sugar levels were rated as looking older by those who reviewed their pictures. For every 1 mm/liter increase in blood sugar, the perceived age went up by five months. This study seemed to indicate that even in people without diabetes, higher blood sugar levels resulted in an older appearance. If you’re seeing these signs of aging on your skin, your diet could be part of the reason. The level of AGEs in our blood is not totally under our control. Some of it is genetics, as far as how many your body produces and how well it gets rid of the excess. But that’s not all of it. Whether or not you smoke, for instance, or protect your skin from damaging UV rays that work together with AGEs to age your skin, can make a big difference in how your skin looks. Cut back on your sugar intake: You knew this one already. Perhaps it’s time to take it to the next level. 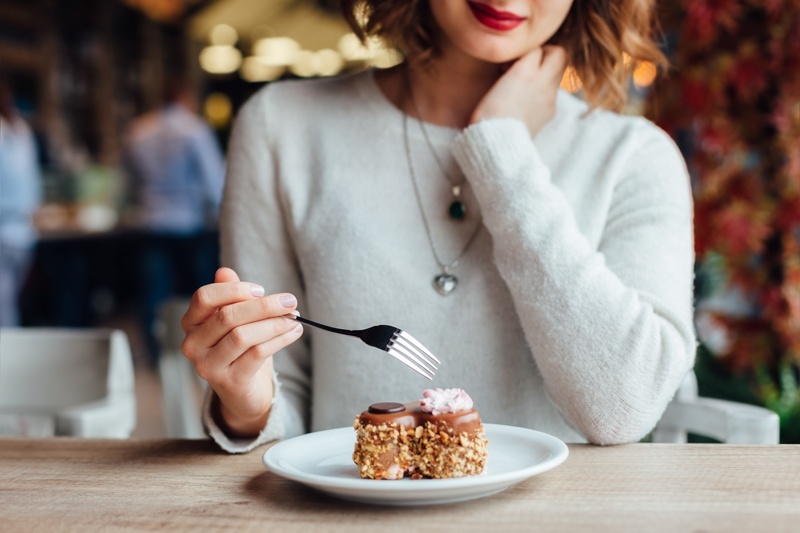 Save your sugary treats for special occasions, and choose healthier dessert items instead, like real fruit (berries are great), low-sugar Greek yogurt, whole-grain muffins (like oat bran and whole wheat), nut and oat bars (with a sugar substitute), popcorn, and the like. Don’t forget to avoid high fructose corn syrup as well, which increases blood sugar levels and is prevalent in a number of processed foods. Learn to eat low-glycemic: The glycemic index was created to help diabetics keep their blood sugar levels under control, but it can also help you to avoid going overboard with your glucose. Your best bet: limit white bread, white rice, white potatoes and other items that spike blood sugars, and choose whole-grain options instead. Lean meats, most veggies, eggs, nuts, and seeds are all good options. (To check the glycemic index on over 100 foods, check out this Harvard Health link.) When you do indulge in white potatoes, pair them with protein (meat and potatoes is better than potatoes alone), olive oil, avocados, salad, or salsa to slow down the rate of digestion. Eating the skin also helps. Protect your skin: Here is another reason to regularly wear sunscreen-UV rays accelerate the formation of AGEs. Don’t forget your hands, which can be the first to give away your age! Stay in shape: Both obesity and muscle loss accelerate AGE formation. Maintain a healthy weight and add weight training to your weekly exercise routine. Muscle helps consume excess glucose, keeping blood sugar levels stable. Eat more antioxidants: Antioxidants fight against free radicals, and help protect your skin from glycation. Eat more fruits and veggies, which are rich in antioxidants, and consume more green tea. Good supplements to consider include vitamins C and E and resveratrol. Get more vitamin B: Vitamins B1 and B6 have been shown in studies to help inhibit the formation of AGEs. You can find these vitamins in animal products (fish, poultry, eggs, dairy), or use a quality supplement. Use nourishing skin care products: Check the ingredient list. Products that contain antioxidants, like vitamins C and E, herbal extracts, turmeric, and natural oils, help protect the skin from glycation. Might we suggest CV Skinlabs, which are full of all of these ingredients? Have you noticed the affects of glycation on your face? Please share your story. Jeanmaire C, et al., “Glycation during human dermal intrinsic and actinic ageing: an in vivo and in vitro model study,” Br J Dermatol., July 2001; 145(1):10-8, http://www.ncbi.nlm.nih.gov/pubmed/11453901. Melpomeni Peppa, et al., “Glucose, Advanced Glycation End Products, and Diabetes Complications: What is New and What Works,” Clinical Diabetes, October 2003; 21(4): 186-187, http://clinical.diabetesjournals.org/content/21/4/186.full. Yamagishi S., Matsui T., “Advanced glycation end products (AGEs), oxidative stress and diabetic retinopathy,” Curr Pharm Biotechnol., March 1, 2011; 12(3):362-8, http://www.ncbi.nlm.nih.gov/pubmed/20939798. Raymond Noordam, et al., “High serum glucose levels are associated with a higher perceived age,” AGE, February 2013; 35(1):189-195, http://link.springer.com/article/10.1007%2Fs11357-011-9339-9. Have You Misdiagnosed Your Sensitive Skin?